Even though the weather hasn’t been that bad this winter in New England (yet), I still have a major case of the sads for warm weather. What we do to beat the sads is travel 40 minutes into Boston to see every gallery on Newbury Street, and then there’s the MFA, Boston and ICA. So, we douse a dose of the sads with ART. If you’re having the winter sags, I thought you might be interested in this artist—whose name is not a household word—because his work is beautiful, and he doesn’t seem to be on the Top 40 list of art historians who write art history books. Ignore the fact that the look on the recorder player’s face reflects mine with my winter sads! One of the most interesting things about the artists who were influenced by the style of Caravaggio (1571–1610) was that most of them put their own spin, as it were, on the over-the-top drama of Caravaggio’s work. The tendency in the Late Renaissance style of Mannerism for overblown drama, exaggeration of movement and form, and theatrical compositions resolved itself into the Baroque style (arbitrarily dated ca. 1600–1750). The Baroque was a wonderful combination of the Renaissance obsession with antiquity and realism, and the tortured forms of Mannerism. Bartolomeo Cavarozzi was born in Viterbo, which is northwest of Rome almost half way to Siena. 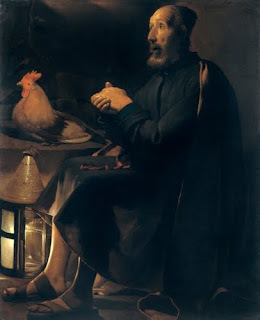 He settled in Rome at an early age, where he was probably trained by the painter Cristoforo Roncalli (1552–1626, also not a household name in art history), a Mannerist painter whose works influenced early works of Cavarozzi. By 1610, however, Cavarozzi had come under the influence of Caravaggio’s exciting, dramatic paintings that were available to see in Rome. 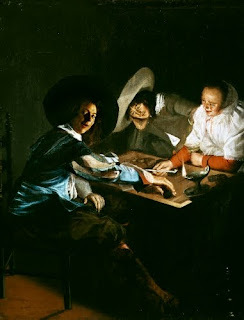 Among the “Caravaggisti” (young adherents to his style), Cavarozzi (who I keep wanting to spell “Caravozzi”!) adapted the style with the least attention to the overblown, dark drama of the master. Caravozzi’s works tend to be more sentimental, although not in the sugar-coated sense. 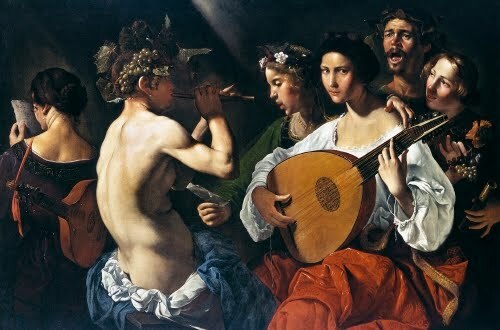 Cavarozzi painted several versions of Aminta, one in which the young recorder player has a bright red coat. The composition if clearly in the style of Caravaggio, with the great attention to physical detail, especially in the still life objects, and the raking light across the figures that causes striking contrasts in dark and light (tenebrism). 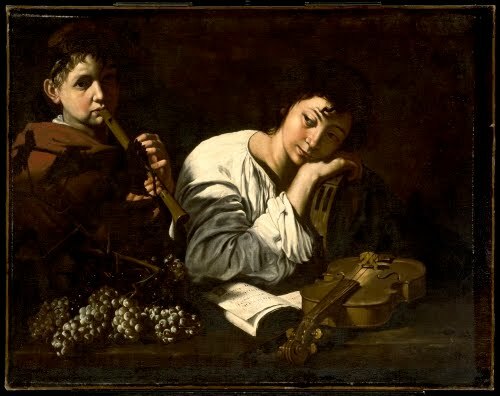 Like many of Caravaggio’s works, Cavarozzi places elements of his composition—in this case the violin—in a sharp perpendicular position to the picture plane, as if it is about the emerge from the painting. This trompe l’oeil type of realism would become a standard of Baroque still life painting. Arminta was a play written by the poet and writer Torquato Tasso (1544–1595), who wrote it for the court of Ferrara. Ostensibly it’s a story set in the time of Alexander the Great (300s BCE) about a love-sick shepherd (Arminta) whose unrequited love for the lovely nymph (nature spirit) Silvia is eventually requited (I don’t know if I can say that but it’s staying). It’s basically an excuse for a lot of moping and melancholy dialogue, which naturally eventually became libretto for operas. Here are some other artists influenced by Caravaggio’s style in the “Caravaggisti” camp. 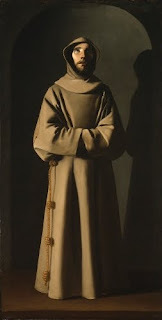 His style had repercussions throughout Europe, from Spain to Flanders and the Netherlands. 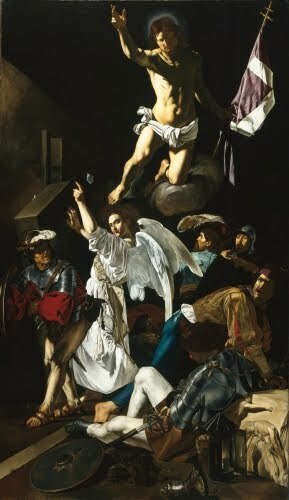 Among the many famous Baroque artists influenced by Caravaggio’s tenebrism are numbered Peter Paul Rubens (1577–1640) and Diego Velázquez (1599–1660).